The LingvoSoft Spanish Platinum Pack is a superb collection of LingvoSoft software featuring the Spanish language. It equips you with advanced applications for all the devices you have now or will have in the future. If you are a student of languages, a businessperson dealing with Spanish native speakers, or a frequent traveler to Spanish-speaking countries, this comprehensive package will cover your needs in a convenient and cost-efficient way. Ectaco Spanish-English U-Learn Advanced contains extensive material for vocabulary building and development of pronunciation skills. Includes 15 human-narrated courses with a combined duration of approximately 20 hours. 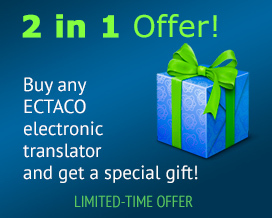 Ectaco English-Spanish U-Learn Advanced contains extensive material for vocabulary building and development of pronunciation skills. 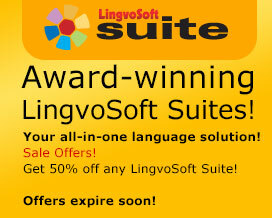 A unique combination of award-winning titles that make working with a languages easier than ever before, LingvoSoft suites bring together the most effective and reliable tools we have to offer in a single collection. A global solution for your desktop or laptop PC, they deliver enhanced language management and translation functionality you can count on and are completely Windows 10 ready. A unique collection of our most popular and useful applications that are Windows Mobile 6.0 ready, LingvoSoft suites include a combination of professional tools that make working with a second language easier than ever before - anytime, anywhere. A global solution for handheld devices, they answer all your multiple language management and translation needs reliably and accurately. LingvoSoft Talking Text Translator English <-> Spanish for Windows is part of LingvoSoft Suite - the complete language solution available only from LingvoSoft. Obtaining precise and consistently understandable translations of complex texts has never been simpler. Used by professional translators, this robust utility is able to translate virtually anything - from business letters and e-mails to technical documentation and even entire books. Making working with difficult or lengthy texts as easy as translating a single word, its sophisticated syntactic databases and superior programming provide the precision and dependability that allows you to manage complex translation tasks effectively. An outstanding talking full-text translator that delivers fast, accurate and understandable complete texts from any source. LingvoSoft Talking Text Translator English <-> Spanish for Windows Mobile is part of LingvoSoft Suite - the complete language solution available only from LingvoSoft. The preferred tool of professional translators, this reliable utility translates virtually anything - from technical documents and e-mails to business and personal letters, and even entire books. LingvoSoft Talking Dictionary English <-> Spanish for Windows is part of LingvoSoft Suite - the complete language solution available only from LingvoSoft. First choice at home, at school or at work, LingvoSoft Dictionary provides instant bilingual translations that can be voiced aloud using the latest TTS (text-to-speech) functionality, delivering accuracy you can depend on time and again.